Perfectly situated at the centre of the entertainment precinct and only 100 metres from the iconic Surfers Paradise Beach, Mantra on View Hotel is surrounded by shops, restaurants, cafes, nightlife and attractions. The hotel offers guests modern facilities in a fun, fresh and vibrant atmosphere. 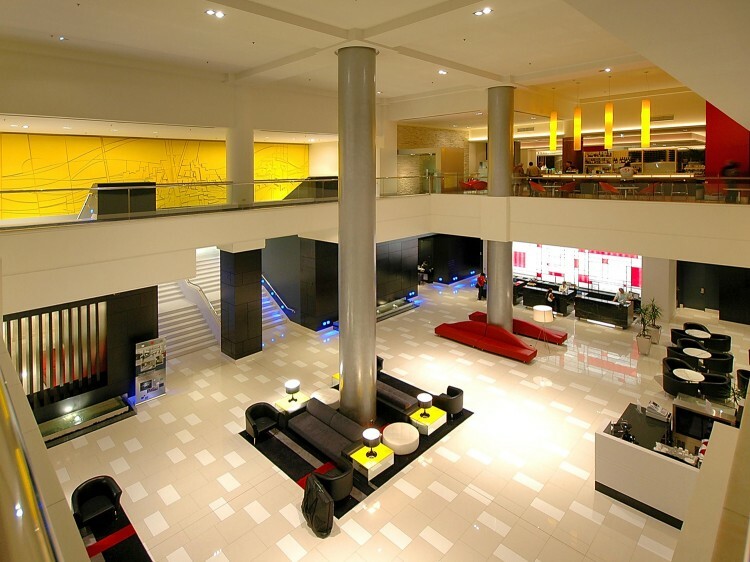 The hotel offers 411 spacious, refurbished hotel rooms with sweeping views of Surfers Paradise and the Pacific Ocean. Featuring a spacious pool area, children's wading pool, spa, gymnasium, business centre and conference facility, Mantra on View Hotel is the ideal choice for business and leisure travellers. At Mantra on View Hotel, everything is at your fingertips, the only decision you'll need to make is what to do first. Beach, attractions, shopping, nightlife or dining are just moments away. Relax on white sandy beaches under the warm gold coast sun; indulge in endless dining and entertainment options or experience the Gold Coasts world famous theme parks. Just a one minute walk to the iconic Surfers Paradise Beach, or one block from the dining and entertainment hotspots found on Cavill and Orchid Avenues, discover why Mantra on View Hotel is the perfect base to explore the fun, vibrance and entertainment the Gold Coast is famous for. Nosh Pan Asian - you’ll take pleasure in authentic Asian inspired specialties. There is also a selection of hearty Modern Australian favourites to enjoy like chunky burgers, seafood platters, creamy carbonara pasta and mouth-watering steak and seafood dishes. Make use of the private dining room for your upcoming meeting or celebration, and enjoy a selection of the finest dishes from set menus. For larger functions the restaurant is available for exclusive hire, or move into one of Mantra on View’s conference spaces for more flexibility. The bar terrace is the perfect spot to kick back, relax and soak up the sunset. Enjoy a choice of ice cold beers on tap or a cocktail from the extensive list. Serenity Medispa features 7 spacious treatment rooms, a Hydrotherapy massage bath, Vichy shower, infrared and colour therapy and three private couples suites with their own balconies offering ocean views. A perfect way to relax with an indulgent range of treatments including Bamboo Fusion Massage or Caviar Gold Facial. Features 2 double beds and balcony views of the Surfers Paradise skyline. Located on levels 5-13. Features a king bed and balcony views of the Surfers Paradise skyline. Located on levels 5-13. Features 2 double beds and balcony views of the ocean and Surfers Paradise skyline. Located on levels 14-18. Features a king bed and balcony views of the ocean and Surfers Paradise skyline. Located on levels 14-18. Features 2 double beds and balcony views of the ocean and Surfers Paradise skyline. Located on levels 19-22. Features a king bed and balcony views of the ocean and Surfers Paradise skyline. Located on levels 19-22. Features 2 double beds, separate living room and balcony views of the ocean and Surfers Paradise skyline. Located on levels 6-19. Features a king bed, separate living room and balcony views of the ocean and Surfers Paradise skyline. Located on levels 6-19. A credit card pre-authorisation will be required on check-in for all bookings. Should a credit card not be available, you will be required to pay a cash bond. Parking is available at the adjacent public carpark which has a height restriction of 1.9m. Self-parking is charged at $8 per car per 24hr period, additional fees will apply after 24hrs. Valet parking services are also available at $15 per car per 24hr period, additional fees will apply after 24hrs. Due to access via stairs we recommend unloading luggage at the driveway prior to parking.